Assembling a guitar is just the start! We have been building guitars for satisfied customers ever since establishing our repair & set-up services commercially back in 2008. Some instruments turn up as a box of parts; others are partly finished projects that need the final stages taken care of. High standards of craftsmanship go into all our build commissions & no instrument leaves our guitar repair centre, until we are entirely satisfied with every aspect of its playability. All our custom build guitars are guaranteed (please see terms & conditions at bottom of page). There’s lots of choice these days when it comes to replica guitar bodies & necks, owning a custom instrument has never been this easy, although several factors need careful consideration when choosing the make up of your guitar or bass. Compatibility issues (common on project instruments) can be avoided with a little bit of pre-purchase research. We can assist if you are considering a custom built instrument & offer advice on suppliers, wood types, finishing options (if required), hardware, bridges & pickups. There are plenty of manufacturers out there offering some fantastic guitar & bass kits including Warmoth, Stewmac & Northwestguitars just for starters! Please contact us if you have a build related enquiry. If you require a project completing & you’re contacting us via email, please describe the work necessary to complete the instrument. Sometimes a few photos can be helpful. 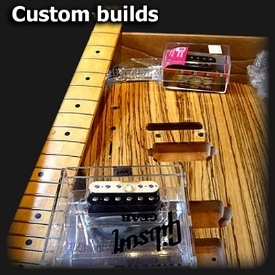 Set prices are not available on guitar builds (kits or projects) but no-obligation, estimated quotes can be given via email based on personal requirements. It’s always better (whenever possible) to pop into our repair centre, where we can discuss your project details & costs in greater detail. All custom built instruments will require a set-up upon completion, please see guitar & bass setups page for details. Deposits may be required on certain custom-built guitar orders. A custom guitar example can be viewed lower down this page. Unlike commercially available guitar kits, project guitars often involve bodies & necks from various instruments coming together Frankenstein style! Aspects like scale length, neck pocket routing specifications, manufacturing differences & other variations, all have to be taken into consideration when mixing guitar body parts. Guitarlodge can offer advice on any instrument parts you may be considering for a build, & we’ll always try to work closely with you at every stage of the project in order to get the best end result. We have taken on & completed many guitar & bass projects over the years, some with bolt on necks, others with glued in or straight through designs. With so many variables it’s no wonder that two custom built guitars are seldom the same. Guitar kits have become extremely popular over the last few years. Manufacturers are able to quickly & accurately cut out classic well-known production guitar shapes with ease using computer technology. These necks & bodies can be purchased for a reasonable price pre-finished, or natural ready to finish in any colour or style preferred. Due to an increasing demand for these instruments we are now regularly building kits to personal specifications for customers all over the country. The advantages of a kit build over a production guitar are numerous, although deciding on body wood types, necks & components can be difficult with so many possibilities. How do I arrange a guitar kit build? At Guitarlodge we can offer a complete kit build service tailored around your exact requirements. We can purchase all your kit parts, assemble & set-up the instrument (deposit required, see terms & conditions below), or you can source the parts & send them to us. Please see the kit build sites listed at the top of this page for starters, & check out the vast selection of models available. Hopefully this should give you some ideas & get you started. If you have any questions about bodies, necks, paint finishing or component choices please feel free to contact us & we can discuss your build idea! The custom Telecaster (pictured) was built to order for one of our regular customers. He very kindly wrote a few words about the guitar & its specifications. Click image to zoom. Our work policy: We guarantee to carry out the correct procedures required to repair/build your instrument. Should we notice any other work that we feel may need attending to, we will discuss this with you & only proceed if requested to do so. Your guarantee: We always guarantee our workmanship on guitar builds & rebuild work for a period of 6 months. This only applies to the work we have carried out & does not cover string breakages, damage due to misuse or rough handling etc. Many procedures are involved in building guitars; please see the relevant pages on this site if you require information on their guarantee details. Deposits: Please note deposits are required if kits, related components & pickups etc are purchased by us for instrument builds. Deposit fee is based on overall expected cost of parts, please contact us for details. Turnover times: Time-scales can vary on custom made & kit build instruments, please be prepared to wait several weeks in certain cases. Builds can be delayed pending any finish work, availability of replacement parts (If required) & ordering of kit parts from overseas (If applicable). All instrument builds require a set-up on completion.